This new compact addition to the MasterCase line is built with the same FreeForm™ Modular System that defines the series. Customize and adjust your case via swappable aesthetics, adjustable layouts and intuitive thermal performance. Improved layout flexibility handles larger components and cooling systems within a discreet form factor. A case meant for a smaller build that still packs a punch. Build the high performance PC you want in a tighter frame. Its streamlined design with steel and mesh makes this product incomparably stylish. It supports up to five fans, eight HDDs and two graphics cards. Save space and easily transport your build with the MasterCase Pro 3. The reduced size and added top handles mean you don't have to give your PC the awkward bear hug. Conveniently take your case to LAN parties, special events, and trade shows while still fitting the latest full-sized components. Remove the Partition Panel to add space for an additional graphics card. Adjust the Sliding Clip & Click Panel for your needs: HDD cages, DIY cooling system, or remove it. Remove the Front Cooling Bracket for convenient fan or radiator installation outside of the case. The FreeForm™ Modular System allows the MasterCase Pro 3 the same level of customization and upgradeability of the entire MasterCase series. Easily implement all of our MasterAccessories with room for your own customization options, such as DIY liquid cooling. Build a PC that Fits Your Needs. 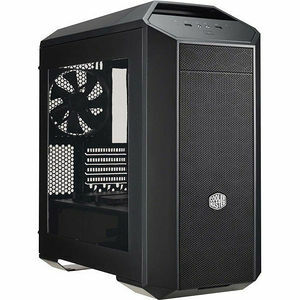 With the MasterCase 3 Pro you have the freedom to build the Micro-ATX PC you want to at a manageable size. There is ample space for up to two full-sized graphics cards, six fans or liquid cooling radiators, and eight HDDs.